overland-underwater.com - A Charity Drive UK-NZ - Gorges, Chasms, Gaps, Pillars and Marbles! Gorges, Chasms, Gaps, Pillars and Marbles! Written by Alex Towns. Uploaded 12 March 2007. Now we've been on a few bad roads in our time and the great Aussie outback driving experience is simply an endurance of endless corrugations which not only shakes loose your fillings but destroys poor Tinfish. The Mereenie Loop Road however was the creme de la creme! The art to driving on corrugations is to travel at a suitable fast speed where you glide over the crests, but this technique only works to a point, especially when you have one seriously heavy car (aka Tinfish) and corrugations as deep as trenches! We had been warned that the road was in a bad state of repair at the Kings Canyon Resort, but this was taking the Mick, specifically since the road is promoted as a 'Tourist Loop'! I'd love to see the faces of Avis etc when one knackered 4x4 was returned. On the rare stretches that you managed to build up any speed over 40kph you soon had to come to an almost stop as you hit the next wave of bumps and the car bucked and shuddered to a grinding crawl... so congratulations Northern Territory, this gets voted as the worst road of the expedition! From the Dreamtime, a large group of women danced across the sky, as the Milky Way. They were stars taking the form of women. During this ceremonial dance a mother put her baby aside, resting in his turna (a wooden baby carrier shaped a bit like a bowl). The turna toppled over the edge of the dancing area and fell to the earth. The baby fell down into the ground and his turna fell hard on top of him. At the place where it crashed into the ground, rocks were forced up from underneath, forming the circular walls of Tnorala. The Milky Way Baby was covered with sand and hidden from view. The mother, as the Evening Star and the Father, as the morning star, are still looking for their missing baby! The geological explanation for the feature is strangely similar! Around 142.5 million years ago an extra-terrestrial object such as a comet about a kilometre in diameter and moving at many kilometres per second collided with the flat layers of rock of central Australia sending out enormously powerful shock waves. The layers near the centre of the blast were first compressed and then rebounded upwards and inwards, till they were near vertical. By 20 million years ago erosion lowered the surrounding plain by a few kilometres leaving the impressive near vertical rock layers. It was strangely captivating to be stood in the centre of the crater and realise what had happened all those eons ago! With another perfect camp, we battled the flies to start up the fire for cooking. One aspect of the great Australian bush that we've really enjoyed is the isolation and tranquillity (less buzzing insects of course!). We've done well on this trip to camp as often as possible and managed an amazing 262 nights snuggled upstairs in our rooftop tent. Unlike the rest of the world however, in Australia you get left alone, which is sheer bliss! The rest of the world is a very small place and even after you've hunted high and low for over an hour for that perfect remote campsite, if someone doesn't find you as soon as you start cooking, they'll most definitely arrive whilst you're washing in the morning. It's no exaggeration when we say that until we arrived in Aus, no few than a dozen nights have we had undisturbed. It is definitely one way to meet the locals and we have very much enjoyed the interaction, sometimes when we don't share a common language all that we've had to communicate with is sign language, our translated flyers (which we had translated into all the major languages we've travelled through) and an inflatable globe to show them the world! Of course we're only human and appreciate those moments of privacy on the precious few occasions where we get it, as it's not like we can just shut the door and disappear into a room. Australia gives you that feeling of isolation in ample servings. After a failed attempt at breakfast... the flies were just too damn overpowering, we bundled back into the car and braved the remaining washer board road. Stopping of at a scenic viewing point we took a gamble on the flies and hurriedly rustled up some breakfast before too many of them tracked us down. We narrowly won, if fishing only a few out of the coffee classes as winning! Stretching out before us were the West MacDonnell ranges, dissected by spectacular gorges with plenty of walking opportunities. Although easily accessed from Alice Springs by tarmac, once more we'd taken the more demanding route, which allowed us to start our exploration to the west, away from the normal activity of day trippers from 'The Alice'. Our first stop was a walk to the multi-hued, cathedral like Redbank Gorge. Due to the recent rains, we were fortunate to see these gorges with water running along the creeks, a sight which is infrequent at best. The chasms and gorges are all the results of river erosion, which given the limited flow they experience it really gives you an overwhelming feeling of insignificance, when the process of erosion from rivers that barely ever flow have been slowly but surely whittling out and cutting away the rock for millions of years to form these immense natural features. Some of the gorges shelter permanent water holes which these days makes them popular swimming holes, but more traditionally were important refuges for the local Aboriginal people and wildlife in and area which seldom sees rainfall. With a number of gorges to see, we simply worked our way along the range, slowly getting closer and closer to civilisation. Next up was Glen Helen Gorge, the start of the tarmac and therefore within reach of the huge coaches of tourists - great! Fortunately the heat of the summer keeps most of the hordes at bay, so when timed right you can still enjoy the peace and tranquillity of nature in these amazing landscapes. Of course here they'd also built a 'resort', tagged onto the roadhouse, although I think the only stars it receives are the billions that twinkle in the clear night skies. This particular gorge is where the infamous Finke River, one of the largest rivers in central Australia and often cited as "the oldest river in the world", cuts through the MacDonnell's. Moving on, we next arrived at the large and rugged Ormiston Gorge. This spectacular gorge is perhaps the highlight of all the gorges. Made up of cubist-like rock formations, these tower over the massive pound, making this a spectacular and unique place. After a quick bite of lunch we headed out on the loop walk, heeding the warnings of needing to wade through knee to waist deep water given the recent rains. The views were surely breathtaking, however when we finally arrived at the water crossing, it was more of ankle deep, but nice all the same to cool the feet down. Being a little gorged out by now, we decided on one last attraction before searching for camp. So time for a quick pit stop at the Ochre Pits! The pits consist of several layers of multi-coloured, layered rock that was traditionally used by Aborigines in ceremonies and played an important role in the continent's economy. The mine belongs to the Western Arrernte people and only certain men are qualified to collect the ochre. It was considered some of the choicest ochre - soft to touch, vivid, with a slight sheen to it. The colours range from gold to crimson. After the ochre was mined, it was ground and mixed with Emu fat for ceremonial body adornment and much of it was also traded with neighbouring clans in every direction on the continent. There are now warning signs displaying exuberant fines applicable to any illegal mining... so it was look don't touch - just to be on the safe side! With our map showing a campsite at the next gorge, on arrival we were faced with everyone else in their Britz rent-a-bush-camper, squeezed into a fairly featureless spot, not like our 5* bush camps we'd found so far. A quick 180 and we were back on the search for camp again. We ended up following a rough track to the ruins of Serpentine Chalets, also claiming to have some official bush camp spots. Hoping the particularly rough track would foil the majority, we weren't disappointed when we once again found a clearing all to ourselves and it appeared that there was no one else down this track whatsoever - except a billion flies of course! The 'historic' chalet ruins tell a story of a failed early tourism venture, but all that remains are the concrete foundations, so not an awful lot to look at. We once again enjoyed the tranquillity to unwind from a day of gorge walks. With plenty of gorges and walks still to enjoy along the MacDonnell's we felt that we'd had a fairly good taster by now, but still wanted to see the one that features on all the postcards. Standley Chasm has been gouged into tough sandstone by the floods that, over untold millions of years, have surged down a narrow tributary of the Finke River system. The result is a deep red cleft crowded on either side by craggy slopes that rise 80 metres above the floor. The Chasm is at its most dramatic an hour either side of noon on a sunny day when the sheer walls glow from reflected sunlight to create a breathtaking display of stark form and rich colour. With this our prime objective of the day, we had a leisurely morning before arriving exactly on time (a rarity for us) for the spectacular sunlight display. Taking stock of our plans over a coffee, we decided to head to 'The Alice' to restock, before turning briefly south to see a couple more of the centre's incredible rock formations. Back on tarmac once more, we wanted to get as far as the unique Rainbow Valley to enjoy the sunset. As is always the case when you arrive back into civilisation, things take longer than you expect, so with one eye on the clock, the other on the sun, we raced south from 'The Alice' towards Rainbow Valley. Of course it wasn't all plain sailing as the final 24km stretch off the Stuart Highway is on dirt roads once more and hence bumpy bumpy. We both willed poor Tinfish onwards... only a few more dirt roads we had planned before we'd be back on tarmac once and for all... all the way to our final destination! We arrived just in time and the view was stunning! Rainbow Valley's main features are its scenic sandstone bluffs and cliffs. These free-standing cliffs form part of the James Range, and are particularly attractive in the late afternoon when the rainbow-like rock bands are highlighted. The coloured rock bands in the sandstone cliffs were caused by water. In earlier wetter times, the red iron of the sandstone layers was dissolved and drawn to the surface during the dry season. The red minerals formed a dark iron-rich surface layer with the leached white layers below. This dark red capping is hard, and weathers slowly, whereas the softer white sandstone below weathers quickly into loose sand. Weathering and erosion are also responsible for the valley shape, where sandstone blocks have been eroded into rock faces and squared towers. It now being dark, we decided the car park was as good a place as any to camp and made good use of the open pit BBQ's with wood provided and the functioning gas burners to rustle up some more superb bush tucker. With tummies full it was early to bed as we had a full day planned tomorrow to drive further into the desert to see the peculiar Chambers Pillar. Being quite practiced now at fast getaways, as the sun rose over Rainbow Valley, we were back on the road, although I'd noticed that one of the tyres was looking a wee bit soft - well it must have been at least a week since our last flat! This time it seemed happy enough to get a quick top up from the compressor, so we decided to live with a slow flat until we got back to 'The Alice'. The drive started out on relatively good dirt roads, which lulled you into a false sense of security before you had to slam on the brakes and take evasive manoeuvres to avoid a wash out and a trench a few feet across! On one occasion it appeared from out of nowhere and Tinfish ploughed through it with a disturbing BANG - BANG, but we fortunately appeared to survive unscathed. The road then steadily deteriorated, before we were faced with a mixture of soft sand dunes and sharp rocky tracks, which then peaked in a horrifyingly steep slope that had us pushed back firmly in our seats whilst Tinfish in low ratio crawled up the side of the cliff. The things we do for sight seeing! Eventually we arrived at the pillar of sandstone that towers 50m above the surrounding plain and felt truly humbled that we were indeed in the footsteps of some of Australia's greatest pioneering explorers. Whereas we had the convenience of a modern day 4x4, back in 1860 John McDouall Stuart first crossed this inhospitable nation on horseback, with absolutely no idea where they were going or what they might find, in an effort to navigate a route between Adelaide in the south to Darwin in the north. Until the coming of the railway in the 1920s, the pillar was a landmark in the desert on the long overland journey. Many early travellers left a record of their visit in the soft, white sandstone and you can climb up to the side of the pillar to see this early rite of passage. Although once more it is supposed to be spectacular at sunset, we were on a bit of a tight schedule, so made do with the midday sun for our stroll around the pillar. It is a place rarely visited by the passing tourist as some effort has to go in to getting to the middle of absolutely nowhere, which once you are there makes the setting all the more impressive. In Aboriginal tradition, Chambers Pillar is Itirkawara, a Knob-tailed Gecko spirit ancestor. Itirkawara was a fierce warrior who travelled widely and killed many others. He was very evil and lived with women who, under tribal law were forbidden to him. Banished because of this behaviour, he brought a girl relative to these sandhills. At this spot he sat down to rest and turned to stone, while his companion, crouching with her face turned away in shame, became Yayurara or the nearby Castle Rock. To the Aboriginal people, Chambers Pillar is a permanent reminder of the need to observe kinship laws. On the gruelling drive back, we passed an Aboriginal community and the sign advertising an art gallery caught my eye. Now we're both partial to a bit of Aboriginal art and some of it is indeed incredibly eye catching. However the dream of obtaining any pieces of this art were utterly dashed when we started our Australian adventure way back in Kakadu. There we popped into the visitor centre and mooched through the shop. Admiring the art there, I casually glanced at the price tag and almost choked. I asked Maz to guess what she reckoned they were priced at.... She guessed about $800 to $1000, but she wasn't even close. The price on the tag was a staggering $10,000...!! Furthermore there was a whole rack full of art, and although $10,000 was the top price, many started from $5,000 upwards..!! We couldn't believe our eyes. My thought now was an art gallery in the community would at least cut out the middle men and possibly we might be able to land ourselves a bargain. This wish soon came crashing down however when the art centre was actually closed. Being persistent we ventured to the community shop which was run by white fellas and made enquires. They did everything they could to track down the art centre manager, or even a few of the artists that normally hung about, but on this occasion they came up blank. As we talked over the cud, I wondered if that by fortune someone might just happen by and after about 10mins of conversation we were in luck as Ali pulled up and everyone called out her name. Ali was more than happy to open up for us, even though we were keen to express that we were just window shopping! Before long we were wading through various collections of art, however the one piece that really caught my eye was lent up against the wall, apparently unfinished. Whilst we were admiring the various art, the artist turned up and Ali enquired what needed finishing on the piece that had interested me. Evidently she'd been in earlier and had actually finished it. Out of curiosity we asked how much such a piece might cost. So after much conflab in Aboriginal they agreed on a price... a mere fraction of the cost we'd seen in Kakadu - not even in the same league! Hmmm, tempted indeed. By this time Maz had also found a lovely piece and we negotiated a price for the two paintings, which coincidentally turned out to be the exact amount Maz's folks had left us as our Christmas present - fate indeed. Although there were many pieces of art to choose from, the other pieces that caught my eye were of a completely different style and for a completely different reason. Whilst I assume each artist finds their own style, I think it's fair to say that the classic Aboriginal style of art is either the dot style paintings or the symbolic animal pieces. Unfortunately some have decided to diversify and expand their styles and somewhere along the line they have received praise and hence encouragement for their new efforts. Now I'm obviously no art critic, however when in dispersed amongst the more classical works of art are more western style landscapes, depicting the animals, land, trees and sun, you are prompted for a reaction. Before you all start wondering what the hell I'm going on about, picture if you will a typical household fridge, with centre place proudly displaying a work of art held by fridge magnets and age 5 years along with your kids name scrawled in the corner! Now art or no art, there's no way I'm paying $600 for a landscape where the sun is a yellow ball in the centre with bold lines radiating out from the edge..! My advice, should they be interested is stick to what you know and do best! Ali invited us back to her place for tea whilst she wrapped up the paintings and it made for interesting conversation as she was one of the Stolen Generation. Like hundreds and thousands of other Aboriginal children, she was forcibly taken away from her family so that she could be given a better life! The term Stolen Generations was originally used to describe the separation of Aboriginal children from their families, communities and country by government policy. Dating from the 1880s until as recently as the 1950s this government policy played a pivotal role with the ultimate aim of breaking down Aboriginal culture and assimilating Koorie people into European society. Each person has different experiences, but overall the Koorie community carries a lot of pain, sadness and anger as a result of what has happened to the Stolen Generations. It is a horrific and inhumane policy the repercussions of which are still troubling the conscience of the wider Australian society. With evening fast approaching, we said our farewells and headed north in the general direction of Alice Springs. Fortunately the road had been newly graded so the going was far easier, although we were still keeping one eye on our slow flat. We'd decided to stay in the bush and delay getting back to 'The Alice' until the next morning, so a little way before town we started scouring the bush for a suitable track and it wasn't long before we were pulling off the road, setting up camp and firing up another fire to cook some bush tucker. Ali had shown us half a dozen kangaroo tails that are cooked buried underneath the fire and is the ladies favourite tucker - nice sweet meat. We didn't have such luxuries. Being a day longer than planned we didn't have any choice bits of meat left to BBQ, so we made do with tinned ham, cheese and onion toasties. Maz had moaned continually at the buying of the tinned ham, but I was persistent as you never know when it might come in useful... she was thankful for it tonight and the tucker was yummy! Before the final sprint into town, we stopped off at Ewaninga Rock Carvings. In the maze of designs you could see concentric circles, wavy lines, barred circles and animal tracks. However, unlike 'narrative' rock carvings which tell a story and are easily interpreted, these were 'abstract' carvings which are intended to conceal their meaning from people who aren't initiated members of the group who carved them. Each symbol has a unique meaning that is linked to the locality where it was drawn, so the common concentric circle may represent 'waterhole', 'campsite', 'a meeting' or something else, depending on where it was drawn and who it was drawn by. With a list of provisions to buy and things to do, after a relaxing coffee we split up to complete our assignments... laundry, internet, shopping, fuel, repairs. For a change I was pleased to see that the slow flat was something simple like a bit of wood stuck in the tread, rather than the commonly split wheel we've been plagued with, so it was easily repaired. Again time disappeared from us, but we wanted to get north to the Devil's Marbles before sunset and that was still another 400km away. So with not a moment to spare we hit the road again, only to now find that the cruise control had stopped working - arse! With immensely boring dead straight roads, if ever we could have done with cruise control, this would have to be that moment - typical! This time we weren't quite in time for sunset as we arrived at dusk, so that would mean up early in the morning to catch the sunrise, I couldn't wait. The car park around the back doubled as a camp site and we for the first time in ages shared our camp with at least half a dozen other travellers. 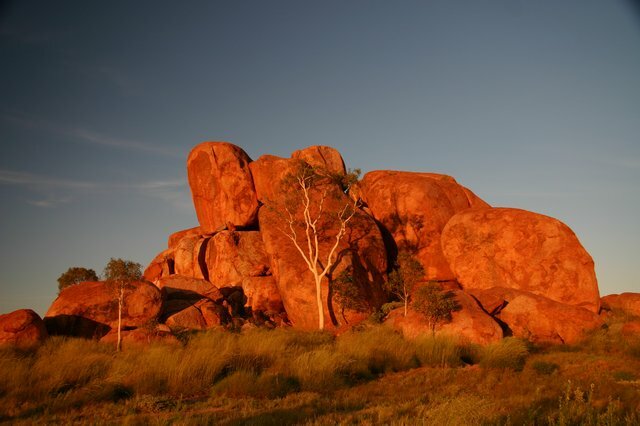 Devi'ls Marbles (Karlu Karlu) is a most spectacular landmark with thousands of huge, precariously balanced granite boulders. 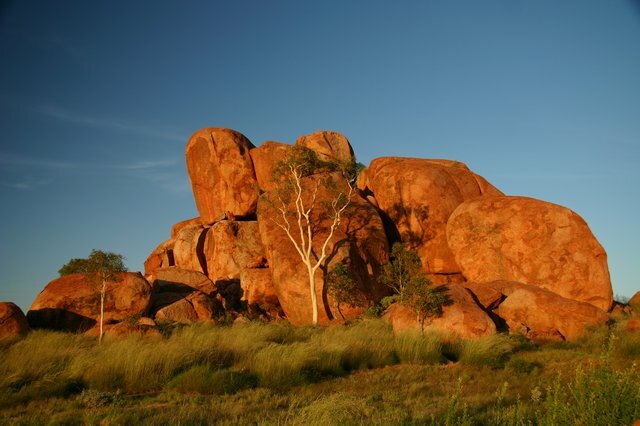 The Kaytetye Aboriginal people believe that these boulders are the eggs of the Dreamtime's Rainbow Serpent. 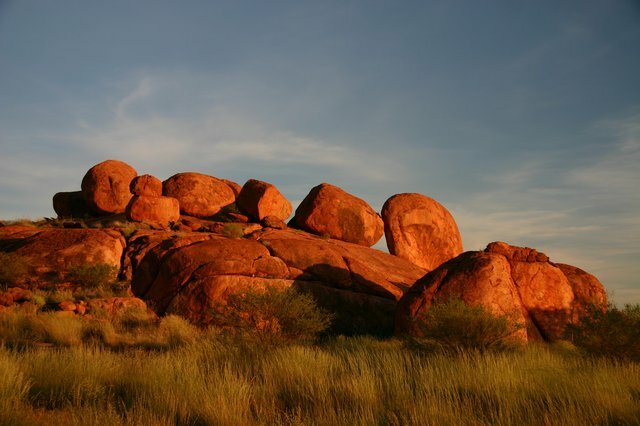 Over time, the ceremonies and stories related to the Devil's Marbles have largely been lost, but the site is still very important to the tribe and may be considered to be among the oldest religious sites in the world. 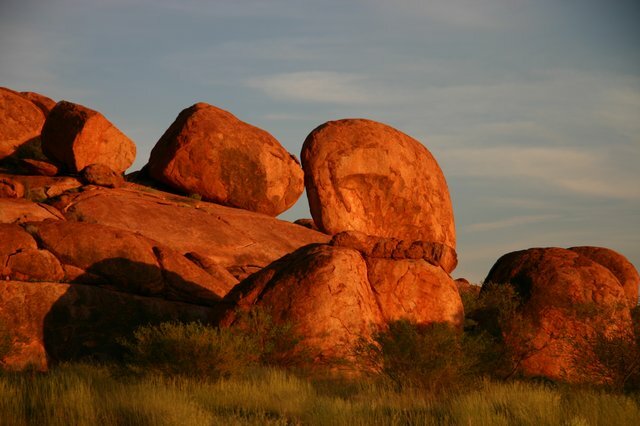 This dramatic collection of giant, perfectly rounded boulders is strewn across a shallow valley. The Marbles resulted from a series of granite intrusions that occurred 1,700 million years ago. Geological evidence exists that molten lava from deep within the earth's crust was squeezed into huge domes just below the surface and the rocky overlay was worn away over time to expose the Devil's Marbles. We spent a few hours in the early morning sun, exploring the fields and fields of boulders. When you've decided you'd seen enough, you suddenly caught glimpse of another formation in the distance and you'd traipse over for a closer look. With all the recent rain this was made more precarious as the ground had blossomed into a sea of spiky spinifex bushes, so you had to carefully pick you way around for fear of continually being pricked by the needle sharp leaves. So any forward motion required a complex circle of winding paths to get anywhere. Having made the detour up north this far we were now only a matter of 1000km from Darwin where we arrived in Australia 3 months before. However this bizarre S shaped route around the vast country made use of the more suitable roads and although there was a 'short cut' east from Alice, it would have been on more dirt roads and after a few days shaking yourself to pieces, it just looses its interest. We were now acutely aware that Tinfish was getting tired so we made a conscious decision to stick to the tarmac from here on in.